Use Leftover Candy Corn to Make Candy Bars! Personally, I don’t mind candy corn – though the pumpkins are my favorite – but I know it’s not everybody’s favorite. 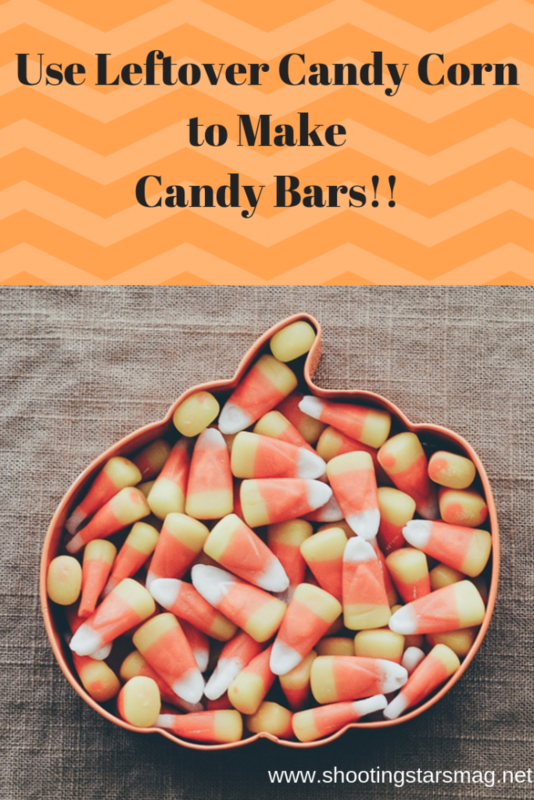 However, now that Halloween is over, I’m here to share how you can turn some of that leftover candy corn into candy bars! I actually just learned about this one; it was at the adult summer camp that I attended in September. However, I got to try it out and it’s so yummy, so I highly recommend if you’re a fan of Butterfingers. Plus, these aren’t as hard to bite into. Since I don’t have the exact recipe the chocolatier used when I was at camp, I found one online that’s the same ingredients (just with the actual measurements, since that’s what I didn’t have), and you can find that here. I don’t know where I first heard about this, but it’s been a few years now, and it’s something I’ve been telling people about ever since. To make a Payday, you don’t have to do any sort of baking, and measurements really don’t matter. How awesome is that? Grab a bag, or just use your hands if you’re desperate for some candy, and mix peanuts and candy corn together (probably about an equal amount of both) and then eat it up. Eating these two ingredients together gives you the wonderful taste of Paydays! It’s like magic! There you go – two fairly easy ways to turn that leftover candy corn into yummy candy bars! If you’ve done either of these in the past, or go and try them now, I’d love to know what you thought! I am not a fan of candy corn, so there would be a ton leftover if I had any, but I like your ideas for up cycling it. I really love your idea of using the candy in a clever way! (otherwise it can hang around for a while, and then I eat it.. all!) This is a nice post to make something a bit more exciting with it! I love candy corn. It’s a fall staple for me! This is a wonderful idea for using up that leftover candy corn. Pulling out the cookie cutters today. I love the idea of Paydays. I’m not really a candy corn fan. It just tastes like lumps of sugar and I don’t see the appeal. However, I could get behind using it to create other things. What a great idea!! (Got anything for tootsie pops? Hahahaha.) We tend to eat all the good stuff (Twix, Snickers, etc.) but we have lots and lots of suckers left over!! Ha! I rarely have leftover candy corn, because I love it so much! But this is a fun idea! I like to make something with leftover Halloween candy too! I like to make chocolate chip cookie bars or cookie pie and throw in chopped up candy! I do like candy corn, but not a fan of butterfingers. This is a great idea, I’m sure my dad would like this. I’ve never heard of using candy corn to make candy bars. My family likes candy corn and candy bars, so this sounds like a genius idea! Oh! It took me a while but I see that you are mixing candy corn with another candy to make a completely different candy. Unfortunately I don’t like peanuts or candy corn. I do like the idea of mixing candy to make more candy. Awesome idea with candy corn! I used leftover m and ms for cookies and brownies but haven’t thought about using other candy. What a great idea for leftover candy! This sounds like a lot of fun, and a great way to reuse candy! I haven’t had candy corn in years (never was a big fan), and my kids didn’t get any while they were trick-or-treating this year. Creative way to repurpose the candy! I think I’d like candy corn in more of a candy bar/chocolate form!! These are great ideas! I like candy corn but I can pretty much eat anything that has sugar in it 🙂 These are fun ways to mix things up. Great idea! I’ve never heard of this idea before, but it’s definitely worth a try. I do love candy corn, so there is rarely any left over if I buy it. Thanks for sharing this! I’ve actually never heard of anyone morphing leftover Halloween candy into baked goods. Such a great idea! I really like this idea, I enjoy candy corn, and end up with a lot of candy cause I only eat a small piece at a time. I don’t think I’ve ever had candy corn. It’s not a thing over here. From what I can see, people seem to have a love/hate relationship with it but I’m curious enough to try it when the chance arises. I love how fun and simple these recipes are. I personally don’t mind candy corn but my husband and son won’t eat it. I bet they would enjoy those butterfingers though. We had 0 leftover candy this year. I haven’t had candy corn in years but I like it. I like candy corn, but not sure about using them in candy bars. herding cats burning soup recently posted: SIGN UP-- Christmas Recipe Exchange!